The St. Sebastian River provides a glimpse into the old Florida, Florida the way it was before the state was heavily settled. 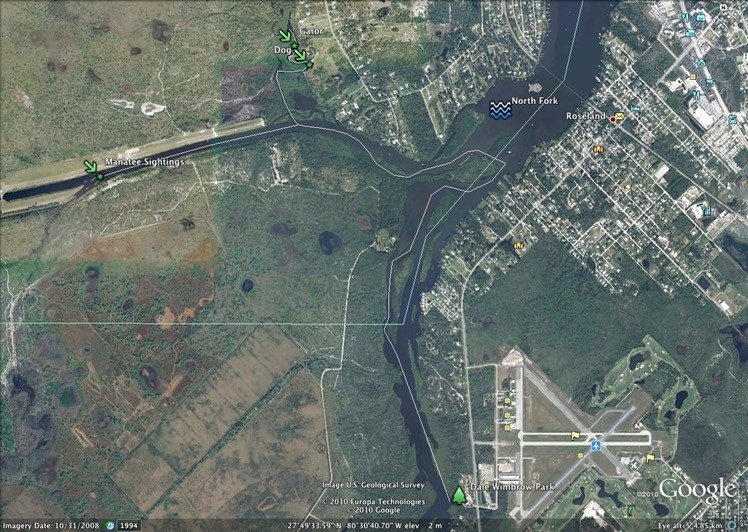 The St. Sebastian River empties into the Indian River Lagoon and at that point is the dividing line between Indian River County to the south and Brevard County to the north. 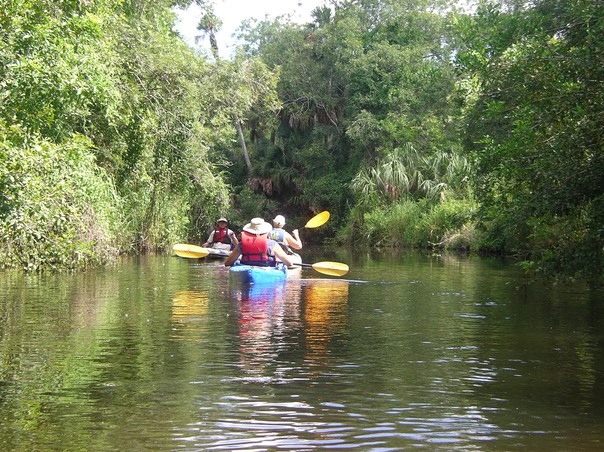 However, the river’s more interesting south fork lies almost entirely in Indian River County. 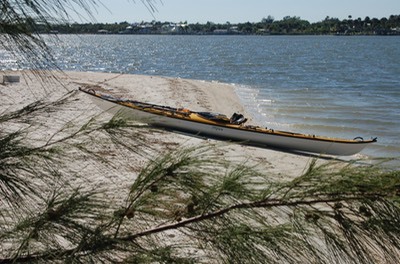 If you want to paddle from the Indian River Lagoon, there is an informal launch point at a little park near the corner of US 1 and Indian River Drive. It requires a carry through some brush to a small beach on the river. 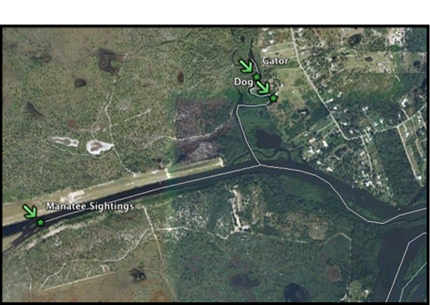 If you launch from either Dale Wimbrow Park or the Donald McDonald Campground you can go downstream (right) toward the Indian River Lagoon. This area is the widest part of the river, has the most boat traffic and is the most developed. Or you can paddle upstream. The St. Sebastian is a slow moving river, so paddling upstream against the current is not a problem, unless you are paddling after a heavy rainstorm. The farther upstream you paddle, the narrower and wilder the river becomes. 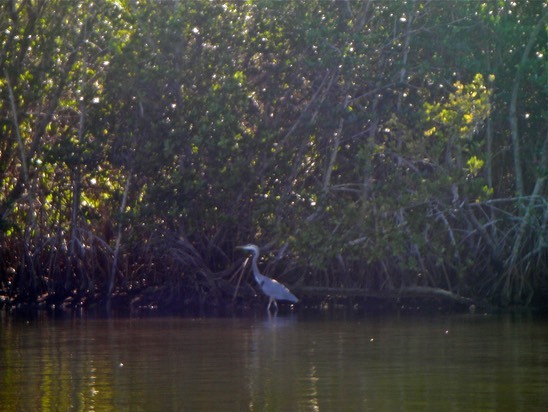 You will always see bird life such as several varieties of heron and egrets, pelicans, ibis, King Fishers and Osprey. I have seen sturgeon and other large fish, mullet jumping everywhere, manatees and dolphin, as well as gators (watch for the monster called “Goliath”), snakes, and box, snapper and Florida soft-shelled turtles. Others have reported seeing bobcats, feral pigs, otter, raccoon, dear and more. Early morning is the best time for wildlife viewing. If you can arrange it, the best paddle is a one way starting at either Dale Wimbrow Park or the Sebastian Canoe Launch. You will of course need to arrange transportation for both the launch and take-out spots. Allow yourself three to four hours for this trip. And be aware that there are limited opportunities to stop and stretch your legs. 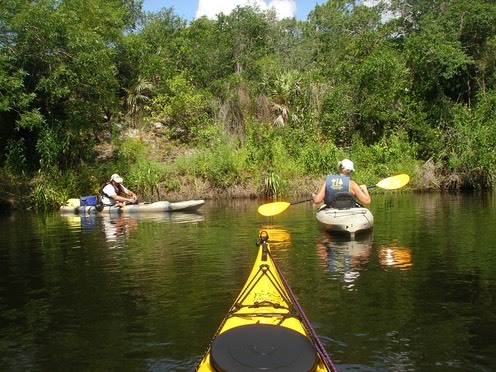 Paddling upstream, the river is lined with impenetrable mangroves until you leave the brackish water of the lower river and paddle into fresh water (and alligators). One stopping place on the lower river can be found just upstream from Dale Wimbrow Park. On the right (north) side of the river are a low platform dock and a set of stairs. The stairs lead to the highest point in Indian River County, the site of a long gone hotel. The dock is a nice place to view the river from and for a snack. Be aware that other apparent stopping spots on the lower river are private property and should be avoided. If you need to do a “round trip” (begin and end in the same spot), I suggest that you start from Dale Wimbrow Park and head upstream. That way, you can set the time you want to spend on the trip (say, three hours), paddle almost two hours upstream, then turn around, knowing that you will be paddling faster heading downstream. The farther upstream you go, the wilder the river gets. You could reverse the round trip and start at the Canoe Launch Park. Understand that there may be snags at the upper end. I had to turn back on one occasion because I couldn’t get through. Be aware that as you leave the launch at Dale Wimbrow Park, there is a tendency to paddle inside of what appears to be a large upstream island. It’s not an island. Head out and around the outside of this "island" and avoid having to do a long backtrack when you hit the dead end. 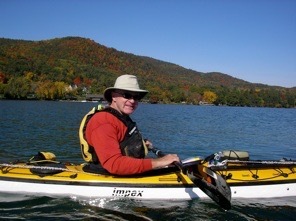 June 21, 2011: Here's a story that some of you who know me and all the stuff I carry while paddling will smile about. 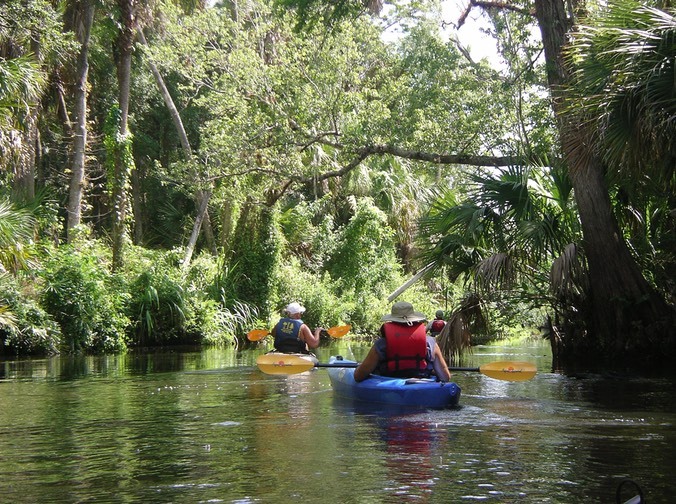 Last week I paddled with Florida Outdoor Center Group on the upper half of the St. Sebastian River. 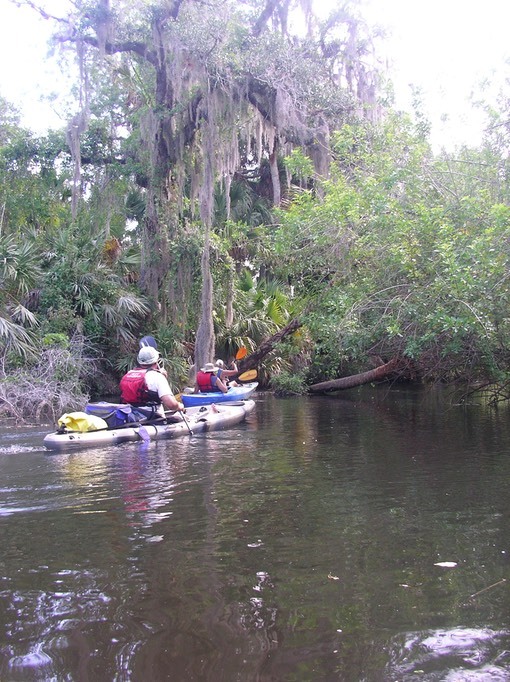 The St. Sebastian is one of the few wild and untouched rivers left on the East coast of Florida. It is narrow and winding on the upper stretches and broadens and straightens as it flows toward and into the Indian River Lagoon. The river is a true sub-tropical area and quite beautiful, if you are drawn to this type of environment. At the put-in, our guide, Greg, had helped me take my boat off the car, then later helped lift it into the water. He commented about how much heavier the boat was as we slid it into the river (reminded me of Bruce's comments). Our paddle was quite leisurely, as we had at least one novice paddler with us. The day was hot (90 degrees) and humid, but there were some clouds and trees to give us some relief. The breeze under the trees was glorious! We saw almost no wildlife; just a turtle or two, but lots of fish - Mullet and Gar. We stopped for an ample lunch at about the halfway point between the launch and the Lagoon. This was a raised spot, clear of brush, about the only place we'd seen where a group could get out and stretch. Two of the boats were pulled out of the water and used as a table for lunch preparations. I left my boat in the water, tying it to a tree branch with a Scott Keller required painter. The ground was dusty, with a few dried up sprigs of grass - Florida has been is a severe drought for some time - everything was dry. As people were putting sandwiches together it became clear that there was no comfortable place to sit, so I went to my boat and pulled out a small tarp to spread as a place to sit. About then, Enid (our novice paddler) wanted to clean her hands, so I went back to my boat and pulled out a Scott Keller sized bottle of anti-bacterial hand cleaner. We had a great lunch thanks to Kristen Beck of the Florida Outdoor Center. Then we headed back toward our launch point, ending our trip in a warm, light rain. I don't know wether to thank Scott or curse him or maybe blame him for all the stuff I carry. He is the presence that sits on my shoulder reminding me of all the safety lessons taught over so many trips on the Hudson and elsewhere. My being over prepared is a combination of what Scott has taught me and, I guess, my own predilections. Dogs and Gators and Manatees, Oh My! or Why I'll Never Paddle the North Fork Again! 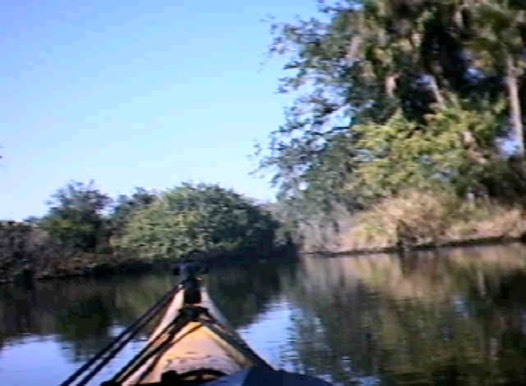 December 18, 2010: I kayaked the north fork of the St. Sebastian River for several hours yesterday. I hoped to see manatees (I’d been told that they congregate there as the water in the lagoon cools) and alligators (I was told that there were a lot of gators on this river, but I had never seen any). The day was like so many days I’ve had since moving here in late August – clear, dry and sunny, with a few white scattered clouds here and there. The morning had been cold by Florida standards, but by 10:30 when I finally got on the river, the temperature was in the low 70’s. 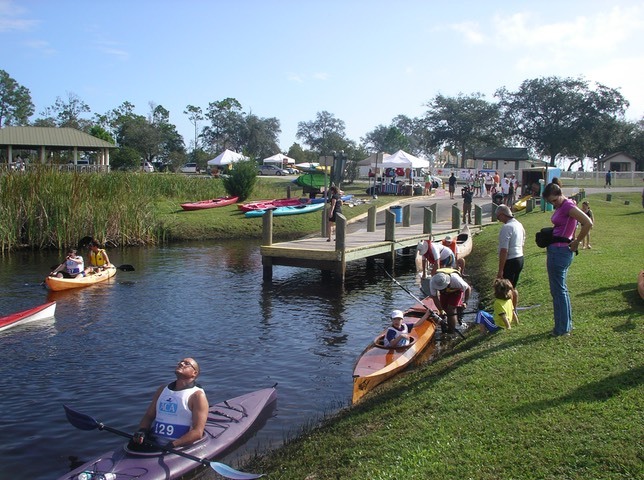 I launched from Dale Wimbrow Park located on Roseland Road, across from the entrance to About Kayaks, a small kayak outfitter. This is a great launch site as you can launch from a grassy point directly into the water or, if you prefer, from the boat ramp if it is not busy. There was a stiff (cold) wind behind me out of the northwest, as I was paddling east on the first part of the trip. The Saint Sebastian has a winding course and is dotted with many mangrove islands, so staying out of the wind was an easy task most of the time. I hugged the north shore as I paddled. The sun was high and bathed the northern banks of the river in a golden warmth. I searched for alligators, following the shore, dipping behind mangrove islands and investigating every sandy spot or mud hole that could possibly hide an alligator. Nothing. I did see a lot of birds - more species of Heron than I ever imagined existed, pelicans, anhingas, cormorants, and especially Osprey. There were many this day and they were actively hunting. Osprey are the only raptor that will actually dive into the water for a fish, and I saw many examples of this, both successful and unsuccessful. I watched one memorable hunt where an Osprey swooped down off of a high tree branch, braked its decent, hovering twenty feet above the river, then delicately touched the surface, its talons barely penetrating the water to dig into the back of a fish so large it struggled to lift its prize out of the water before flying off for a well deserved feast. Soon I was at the north fork. To continue east would take me to the confluence of the Saint Sebastian and Indian Rivers. To the north lies the untamed Sebastian which narrows and meanders to the northeast, while to the northwest is a canal, dam and lock where the manatees are said to gather. I decided to follow the river for a while, still looking for alligators. The river narrowed considerably as I paddled northeast. It was still filled with mangrove islands and an occasional house or river camp. It was peaceful and silent, and I was lulled into a kind of trance as I paddle effortlessly along. As I entered a particularly narrow and shallow area, congested with floating weeds, I heard a terrific splashing off to my right. Turning I saw a large, buckskin colored animal running at me through the water. At first I thought it was a deer, as it made no sound. 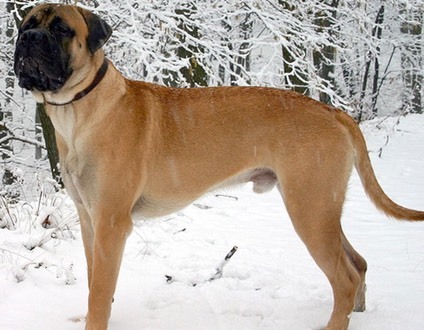 Then I heard the growl and recognized that it was a very large dog and his tail wasn’t wagging! He was really big, looked really viscous and in that shallow water would look me right in the eye if he got any closer. He looked like a cross between a St. Bernard and a Pit Bull. It took about a second for the adrenalin to kick in. Abandoning my intended route, I dug my paddle in and headed for the back of a far mangrove island where I hoped I would find deep water. The monster finally gave up its pursuit, standing chest deep in the river and cursing me with its deep growling bark. I was breathing heavily, and not just from the sprint to safety! I was no longer on the main part of the river, but on some backwater. But I wasn’t going back to where that dog was just yet. The river continued to narrow. The trees began to close overhead as I paddled around this large mangrove island. Up ahead on the island I saw what looked like a structure of some sort. I couldn’t imagine how anyone could build something out here. It was heavily screened by mangroves and vines but, as I got closer I could see that it was a large boat. Did it float here and go aground in some ancient storm? Did someone actually build it here and then find that the river couldn’t float it? It was totally incongruous! Paddling on, I came across two kayakers, fishing. We exchanged greetings as I passed them and continued on upstream. The river was becoming even narrower, only thirty to forty feet wide with overhanging branches. But still, it was again quiet and peaceful so I pressed on. As I rounded a slight curve I paddled close to the shore on the inside, to avoid branches overhanging the outside edge. There was an immediate explosion of water in front of my boat with a wave that rocked me. Out of the corner of my eye I caught a glimpse of the back half of a huge alligator as it exploded off of the mud bank it had been on and slid into the water in front of and under my boat. Mud swirled in whirlpools all around me and I back paddled as fast as I could to avoid any contact with the beast. (I believe it was conservatively 10 feet long, but I think closer to 12.) Catching my breath once again, I eyed the shore for any sign of the creature, but he was nowhere to be seen. Staying in the deepest water, I paddled past his lair and continued on up the river. Large male alligators are solitary territorial animals. Smaller alligators can often be found in large numbers close to each other. 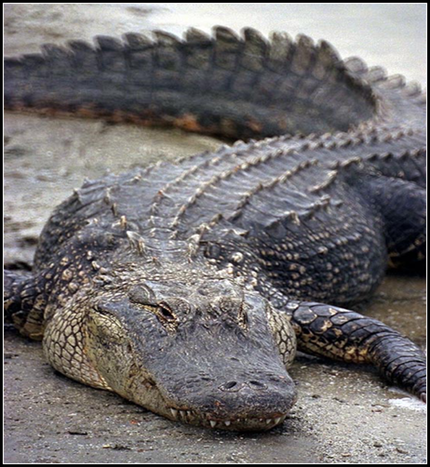 The largest of the species (both males and females), will defend prime territory; smaller alligators have a higher tolerance of other alligators within a similar size class. Although alligators have a heavy body and a slow metabolism, they are capable of short bursts of speed, especially in very short lunges. Alligators' main prey are smaller animals that they can kill and eat with a single bite. Alligators may kill larger prey by grabbing it and dragging it into the water to drown. Alligators consume food that can not be eaten in one bite by allowing it to rot, or by biting and then spinning or convulsing wildly until bite-size chunks are torn off. This is referred to as a "death roll." A hard-wired response developed over millions of years of evolution, even juvenile alligators execute a death roll when presented with chunks of meat. Critical to the alligator's ability to initiate a death roll, the tail must flex to a significant angle relative to its body. An alligator with an immobilized tail cannot perform a death roll. Most of the muscle in an alligator's jaw evolved to bite and grip prey. The muscles that close the jaws are exceptionally powerful, but the muscles for opening their jaws are comparitively weak. As a result, an adult human can hold an alligator's jaws shut barehanded. It is common today to use several wraps of duct tape to prevent an adult alligator from opening its jaws when handled or transported. Alligators are generally timid towards humans and tend to walk or swim away if one approaches. This has led some people to the practice of approaching alligators and their nests in a manner that may provoke the animals into attacking. In the state of Florida, it is illegal to feed wild alligators at any time. If fed, the alligators will eventually lose their fear of humans and will learn to associate humans with food, thereby becoming a greater danger to people. Soon the river narrowed so much that I could no longer go forward. So I headed back, paddled gingerly past the gator’s den, confirmed with the fishermen that there was indeed a really big alligator that inhabited that part of the river, on past the beached boat, then quietly past the man-eating dog’s territory, back out to the north branch and up the canal toward the dam looking for manatees. It wasn’t long before I spotted several. They were in shallow water near a sandbar. I could see the roundness of their backs as they floated near the surface. Periodically, a snout would poke out of the water, take a breath and disappear. I did not approach too closely but tried to call them to my boat by splashing as I had seen the guides do. Alas, none came by. I watched for twenty or thirty minutes, then headed back south and west, toward Dale Wimbrow Park and my take out. I sprinted the last mile to finish a glorious and adventure filled day!